Anaconda: A seven-card card game where bets are placed on five rolled-up cards. Bring In: Bringing in a bet means to place the first bet in the initial round in a hand (blind bets or antes are not including). Any player doing this is known to bring it in." In a game with seven-card stud, many times the card on the board which is lowest would be forcibly made to bring it in. The bet placed this way is known as the bring-in." Double Belly Buster: A hand where there are two inside straight draws would be a double belly buster. Exposed Cards: Cards which are purposely dealt facing-up like in stud. 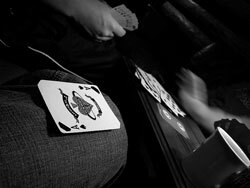 Original Hand: The cards which are dealt to a player prior to the draw. Pick Up Checks: Letting a player bet or raise the limit of a hand for every check that is made before his turn. Private Poker - A Poker game which is played where no money is cut from the players' pots for the profit of the host or the house where the game is played Round the World - Similar to Cincinnati, except that four cards would be dealt to every player and four cards would be dealt to the widow. Slicked-Aced Deck: A deck that has chemically treated aces which are slippery and would allow a cheater to find the aces in a deck. Tennessee: Draw poker game where a bet is made after every round of cards are dealt.